November 21st. 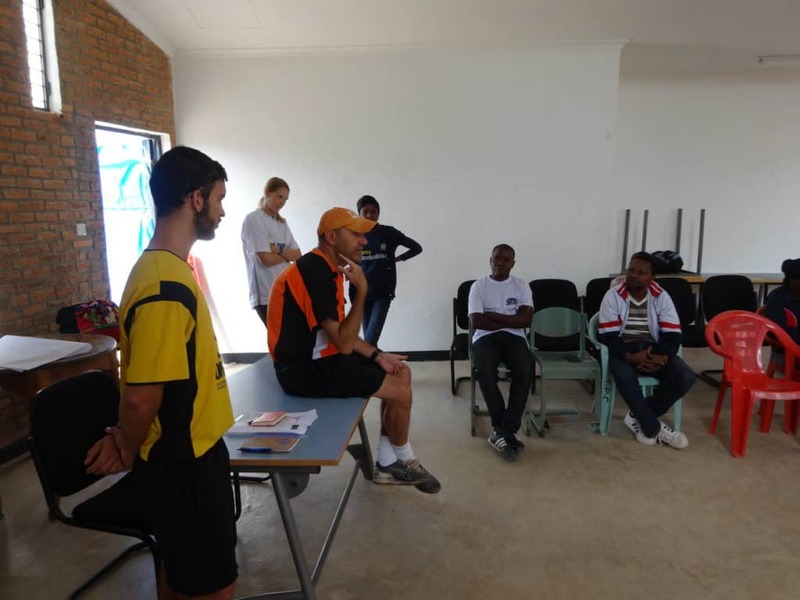 CAC Global Citizen Joseph Lanzillo described his experiences working with IDYDC in Iringa, Tanzania. The city of Iringa is fortunate enough to have a FIFA-sponsored turf field nestled into one of the rocky ridges surrounding the town, where young men from the area gather for a 6 v 6 match every morning. They play without keepers so instead you must hit either goalpost to score, and they rotate 3-4 teams if there enough players. The games are fast paced and can feature some incredibly precise finishing ability. Those not playing lounge on the side wall overlooking the neighborhood on the slope below, where the equatorial sun glimmers off the tin roofs of the buildings. As the games run, other young men filter through to watch and chat with their friends on the sideline, before all pack up to go their separate ways for the day. It is an enviable morning routine; a smooth blend of exercise, community, and scenic beauty – pleasures of life that anyone could appreciate having combined on a daily basis. The same sense of community was shared through our daily sessions at this field with local volunteers for the Iringa Development of Youth, Disabled, and Children Care (IDYDC). All of the participants in our program were passionate about improving their programs for children, for which they volunteered as coaches, teachers and mentors for young people in the area. At midmorning every day, the group took a long break, where a few women of IDYDC brought tea and a few breakfast treats for everyone to enjoy. For about a half hour each morning, the participants, men and women who ranged in age from 19 to 59, socialized together over the meal. On the field, the group was congenial and enthusiastic. Throughout the week, it was clear that not only were they already familiar with each other through their work with IDYDC and enjoyed working together, they also shared the same passion for improving their own coaching skills and their local programs. It was inspiring to see their shared commitment to the larger work of their organization, and even more so to observe their openness to new ideas and willingness to engage with the issues in Iringa. 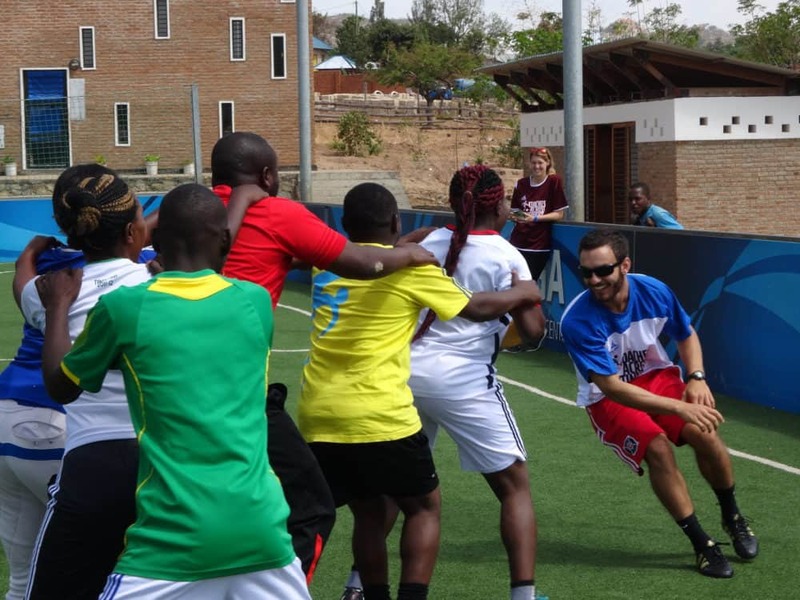 On Monday, as participants made teams for one of the games, there was audible clamor for gender equality on the teams. I hadn’t expected such a deliberate effort or even awareness of the gender inequality that plagues most of the world, and was impressed to see that this was on their radar. Their effort indicated some previous exposure to and willingness to accept such progressive ideas, which seemed to be an encouraging sign for the week’s program. But did the reality of the society in their community reflect the ideas they seemed to support during the program? Who played in the local pick-up games every morning? Men. Why are there no women playing football in the morning? Because they were working in the fields instead. While 20-30 men and boys gathered to play on a daily basis – many of them just loitering near the field – the adjacent land had several women, some of whom appeared to be beyond child-rearing years, toiling away watering and picking crops. Of course, while this one anecdotal scenario does not unequivocally prove inequality between men and women, it is a dramatic example of the disparity that our programs work to bring to the attention of the participants. Indeed, just a short time after the participants so nobly divided into equal teams of men and women, the coaches noticed that men were often taking control of the game and in some instances preventing women from participating in it as fully. During the partner scrimmage game (a normal football game where each “player” on the team is actually a pair of people holding hands), Nick made an example out of one couple (conscientiously arranged to be male and female) where the man denied the woman an opportunity to take a free kick. When he pointed out that their on-field actions did not reflect the ideals of gender equality they had been so vociferous about when making teams, there was a collective moment of consideration, especially among the men. The women too, seemed slightly surprised to have that incongruity called out, but quickly afterward seemed empowered to have some backing to their very real concerns about inequality. Through a series of conversations that week, we discovered some of the intricacies of the gender imbalance in Iringa, and discovered the participants’ collective willingness to address these issues. But at various other moments throughout the week, coaches pointed out instances of participant’s actions and choices that, without noticing it themselves, undermined their stated ideals of gender equality. For several of the men, some of these comments seemed to prompt them to consider how actions and attitudes in their everyday lives were unwittingly promoting very traditional gender roles, and it was exciting to watch them think through how they could make different choices every day that would contribute to a better environment for women in their community. Though the path to complete gender parity in Iringa is long and difficult, the participants’ collective willingness to acknowledge the issue and their efforts to better understand the changes they could make to address it are encouraging signs that seem to show that IDYDC volunteers will be able to have an even stronger impact on their community. I believe that someday, there will be girls playing with the men in the early morning pick-up games in Iringa, and our CAC program there this past week will have been one of many conversations and steps along the way that gradually brought about change in the community. You never get tired i am telling you dear all.This is your uniqueness in doing things you believe in and trust. I am sure that the result of your work and time will transform many things in human’s lives. Keep it up and always remember to make this live and bring more youth.